As Thanksgiving nears, and we turn our collective attention to the food we will be putting on the table, I have been thinking a great deal about a group of farmworkers I met earlier this month. As part of a Symposium on Food Systems and Sustainability, I had the opportunity to travel with a small group of students, professors, and advocates to Knights Landing, an unincorporated community northwest of Sacramento. There, in a community center normally dedicated to child care, language classes, and basic clinical services, we sat down with around a dozen men and women, who engage in the most labor-intensive piece of California’s agricultural puzzle. The day’s events were the product of a collaboration between the Agricultural Sustainability Institute at UC Davis (which was hosting the symposium), the California Rural Legal Assistance (CRLA), and the student-led Real Food Challenge, and it began with a tour of various farmworker housing sites in the area. We visited an orderly state-sanctioned worker camp reminiscent of a World War Two internment camp without the barbed wire, and a barrack-style building that might have been home to five to six families in an average town, but in fact often housed up to 100 single men. After the tour, we landed in a room of Spanish speaking workers and their young children. The majority of workers present were women, so it did not come as a surprise that the conversation moved from commonly discussed issues surrounding farm labor (the paltry wages, dangerous working conditions, and fear-laden environments), to something much more precise and difficult to hear about: sexual harassment and abuse. 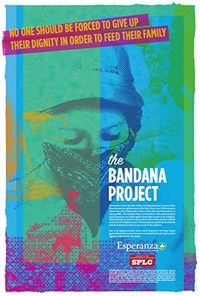 We heard about a support group that CRLA had formed for women who work in the fields, and about a national effort called the bandana project, which collects bandanas with artwork made by farmworker women, who are survivors of sexual violence. These efforts to put a voice to the problem are important because the broader cultural climate often keeps women silent. The vast majority of these women are undocumented, a fact that can leave them profoundly disempowered (the official estimate says that between 50 and 60 percent of farmworkers are living in the country without documentation, but the lawyers at CRLA say it’s likely closer to 90 percent). Nearly everyone in the room said the same thing: complaining or reporting a manager’s inappropriate or violent behavior only tends to result in a loss of work. As a matter of fact, if the managers–or “majordomo”–found out these men and women were at the community center speaking with us, they might never get work again. A comprehensive new report released last week titled “Injustice On Our Plates,” from the Southern Poverty Law Center (SPLC), corroborates what these workers were saying. After speaking with 150 immigrant women from Mexico, Guatemala, and other Latin American countries, SPLC found that a majority said “they had endured some sort of sexual harassment—which, at times, rose to the level of sexual assault—while working in the fields, packinghouses, or processing plants.” Many women, the report adds, saw sexual harassment and sexual violence as just another part of the job. There are an estimated 4.1 million undocumented women in the U.S. today, and many of them work within the food system in some capacity. And, perhaps not surprisingly, they make less than their male counterparts. According to the SPLC study, the average female farmworker earns a little over $11,000 per year, whereas the average male earns $16,000. Not to say that men in the fields have it much easier. We heard from one young man wearing a “Freedom USA” T-shirt who said he had been fired for sitting down in the fields when he was worried he might pass out from heat exhaustion. An older gentleman—in his 50s or 60s—told of losing consciousness due to dehydration, and then being left at the work site for 40 minutes after a manager had been telephoned. One woman named Lupe, who was around my age, spoke up to say while it was terrible to be harassed by the majordomo–what was worse was the fact they all happen to be fat and ugly. We all laughed with her in solidarity, even though it was a painful kind of laughter. As outsiders, there was little we could do but listen and wince, frown, and contemplate how arbitrary it felt to have been born into the lives that placed us on one side of the room and not the other. In the weeks since that day in Knights Landing, the farmworkers have loomed large in my mind. As we drove away that day in our big, white campus van, we passed three women walking along the road, returning to a cluster of badly maintained apartments that had the look of a dilapidated motel. One of the lawyers in our group had described the interior earlier in the day, naming things like unsafe wiring, cockroach infestations, and crowded quarters. On the day the SPLC released its report, it had been exactly 50 years since Edward R. Murrow’s “Harvest of Shame” documentary aired on national television, exposing the extreme hardship and poverty migrant farmworkers faced at the time. Since then, it appears that farm and other food workers have taken one step forward, and two steps back. This is the time of year when we are asked to consider what it is we are thankful for, and I could say: be thankful you do not have to work in the fields. But I do not actually think that is enough. The people who work to grow our food do not need our pity. They need to be recognized as legal residents, and their innate rights as humans should not be up for debate. They deserve to live in a country where they can be thankful right alongside the rest of us. The recent resurgence of Zapatista actions and communiques inspire solidarity that transcends physical borders and cultural differences. Two local voices express in different ways and different languages one important message--you are not alone.